The Swing Aside Mount can be swung away by pulling a cable underneath the horizontal tube. It has three stop positions and is secure on tilting seat wheelchairs. -- Please Select --Large face, no handles +$205.00Large face, one handle +$225.00Large face, two handles +$245.00Small face, no handles +$205.00Small face, one handle +$225.00Small face, two handles +$245.00no thanks! 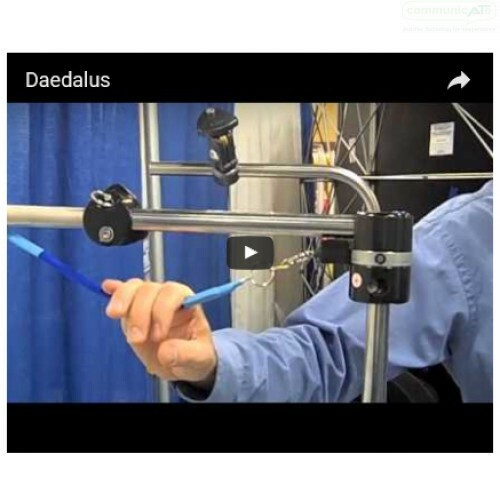 The DAESSY Swing Aside Mount consists of two lengths of stainless steel tube joined to form a right angle structure that is supported on the wheelchair by a Frame Clamp Assembly permanently attached to either the left or right side of the wheelchair. 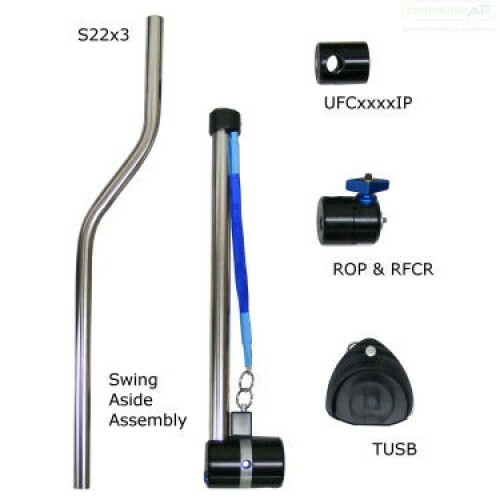 The horizontal tube of the Swing Aside Mount can be swung away independently and is well suited to people with the dexterity to reach the Release Cable that runs under the length of the horizontal tube. A pull down on this cable unlocks the mount and allows it to swing away or swing back in place. The Release Cable retracts a spring-loaded lock pin in the rotating joint. 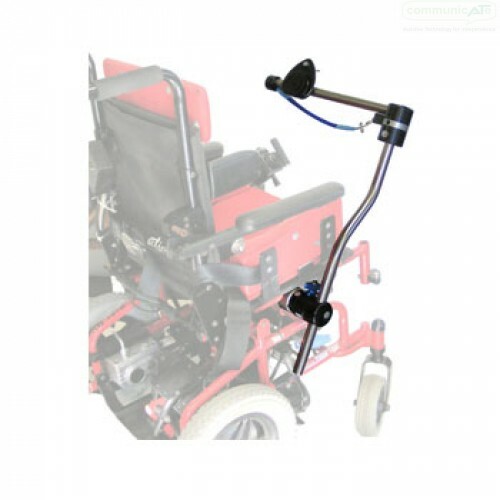 The design of this mount allows for use on a tilt seat system with the rotating joint engineered to only swing away from the person in the wheelchair. The Frame Clamp Assembly is composed of a Frame Clamp Inner Piece and a Removable Frame Clamp Receiver. The Inner Piece is attached to the wheelchair frame while the Receiver holds the Vertical Tube. A Removable Outer Piece secured around the lower end of the Vertical Tube fits into the Receiver to position the tube and prevent rotation. The lock pin holes allow the mount to be swung away and relocked at 90º or 270º away from the user. The mounted device is attached to a quick release plate or a specific adapter (purchased separately), It is attached to the Horizontal Tube of the mount assembly by means of the DAESSY Quick Release Base system which provides security whilst mounted and for quick detachment via the locking pull-pin. The DAESSY Swing Aside Mount can support equipment that is heavy enough to unbalance an unoccupied wheelchair, particularly when the mount is swung aside. It should be completely removed or the mounted device detached before the wheelchair is vacated. 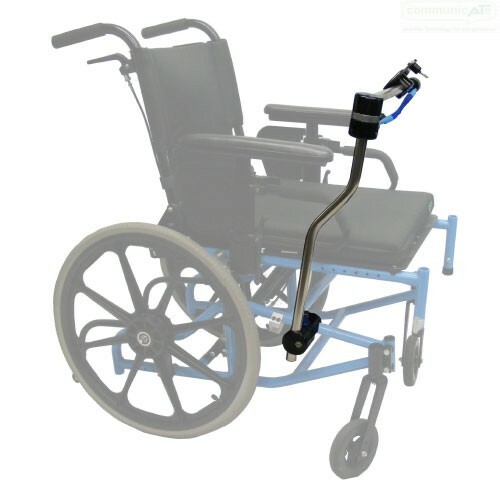 When used on a manual wheelchair it is advisable to remove the device and mount when the wheelchair occupament is transferred to and from the wheelchair.